At first I thought that I wasn't going to like the hostel because I really needed a place to be quiet and I had to leave from 11 to 2, as they clean the hostel during this hours. Everything definitely changed when I got back from the beach just to find such a clean and well prepared room and facilities. It felt like a hotel and the staff, as long as it's not from 11-2, will always give you that smile that one needs when traveling alone. 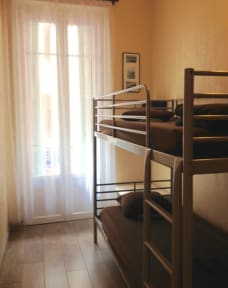 The hostel is perfectly located, close to two supermarkets and pretty much on the main street of nice. 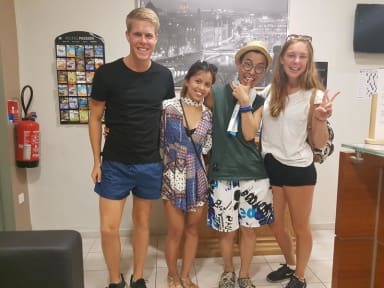 The staff that greeted us was very friendly and helpful and suggested several nice day trips one could take. Unfortunately, due to construction work at the time, the aircon was not working. The kitchenette has pretty much only a fridge, sink, and cutlery, so there was no chance to properly cook anything at all. really good location, short walk to the waterfront and on the main street of shops, 5 min walk from the train station. manager was lovely and helpful with bus timetables etc, bathroom was super nice and clean. only downside was there are no cooking facilities, only a microwave, and the manager wouldnt ler us keep our bags there after we checked out before our train later that day. instead we had to take them to a hotel a short walk away that charged us 6€ per bag. The location is very good, accessebility to tram stop and railway station is less than 2 minutes walk, it had nearby good restaurants, cafe and bars . The staff was not available all the time at the reception, I checked 2-3 times at the reception to get the wifi password but no success. Lockers were not avaialable to keep the luggage. It was a small nice place situated near the center of the City. The only problem was that it has only one toilet available & which is a bit inconvenient. Ac has not been working for month. Not possible to sleep with the weather. Lots of mosquitoes. Never been bitten so much in my life. Too much noise outside you can’t even sleep at night. Internet gets disconnected after midnight. Very controlled hostel. I got asked to leave my room so they can clean even tho I had another night booking, so I wasn’t able to sleep in so they can clean even tho I had another night booking. Shower is tiny. The only plus about this hostel room size. Awful place do not stay! Very far from the city and not very clean either. No one is ever at the counter and even in an emergency no one will be around to help you out, therefore not secure. The area is a bit sketch too so there should be someone to watch over the hostel but there isn't. Tiny place just don't stay here at all learn from my mistake I left days earlier for these very reasons to another accommodation.